Real GDP for China slowed to a 7.6% pace from a year ago in the second quarter compared with an 8.1% increase in the first quarter. 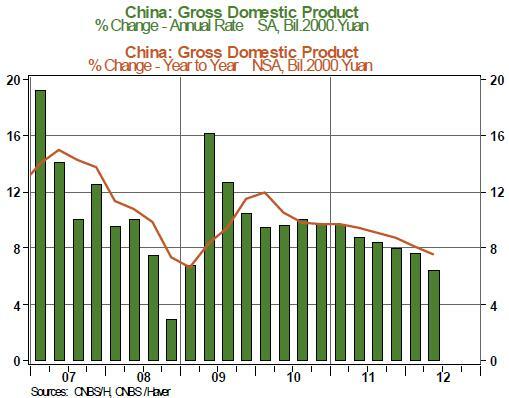 The latest read on GDP growth in China is the slowest since the first quarter of 2009 not only on a year-to-year basis but also on a quarterly basis (See Chart 3), with the second quarter gain at 6.4%. The two important questions are: (1) Do Chinese policy makers have room for policy accommodation? (2) What is the global impact of the recent trend? The important advantage of China is that the authorities have ample wiggle room to manage policy. Inflation is trending down after the aggressive monetary policy actions of 2010 and 2011 and has allowed the People’s Bank of China to lower reserve requirements and cut the policy rate twice in the a short span of time in June and July 2012. 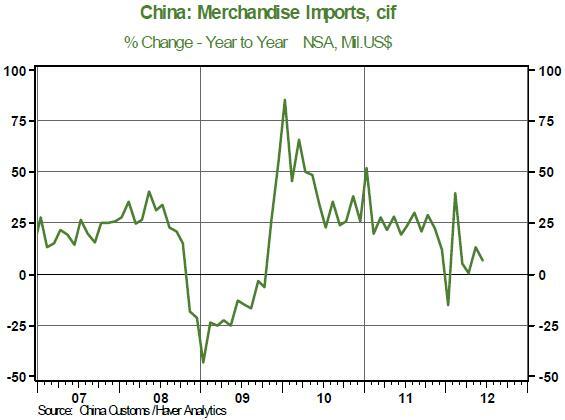 With respect to the second question, if the decelerating trend of China’s imports persists, it would portend setbacks to growth among its trading partners.